Cruise ships dock in an industrial area. Use a taxi or ship provided transportation into town. 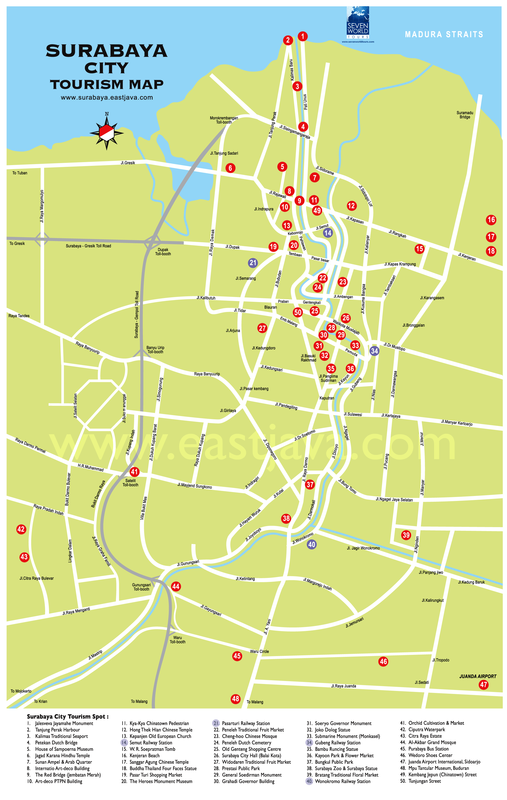 Surabaya old town: 5 km south, Surabaya city center: 10 km south, Trowulan: 87 km south west. The new cruise terminal features a cultural display of the arts and jewels of East Java. Stations are set up in a large display concourse in the terminal where visitors can experience the culture firsthand without straying far from the ship. Taxi tours start at $90, depending on your negotiating skills. Surabaya, provincial capital of East Java and Indonesia's second largest city, served for over half a millennium as trading port for the inland empires of Java. Situated at the mouth of the Brantas River, the city was officially founded in 1293 when raden Wijaya established Majapahit, Indonesia's most glorious empire on the site of a legendary battle between a shark (sura) and crocodile (baya). Surabaya, known as the "City of Heroes" because of its role in nation's independence struggle, has grown into an elegant city of large, colonnaded buildings bordering broad, tree shaded avenues. It serves as the commercial center of a thriving industrial and agricultural hinterland. The city's historical sites include Kali Mas harbor with its tall-mastered trading schooners and, nearby, the narrow alleyways and shops of the Arab quarter, redolent of the Middle East. The historic Hotel Majapahit, where Indonesia's war of independence was begun, and the elegant Grahadi State Buildings, an 18th century mansion, have been restored as monuments to an era of colonial grace. Surabaya is also home to one of Southeast Asia's oldest and largest zoos. The word Surabaya comes from two words: suro and boyo, meaning shark and crocodile. Surabaya serves as a convenient base for exploring the regions many charms, including Mt. Bromo, the cool mountain retreats of Tretes and Malang and the natural wonders of several nature reserves. Trowulan is an archaeological site located in Trowulan Subdistric, Mojokerto Regency in East Java. Surabaya's Jalan Pemuda is the place to be if shopping is what you are after. Here you will find many malls with smaller shops sprinkled in between.